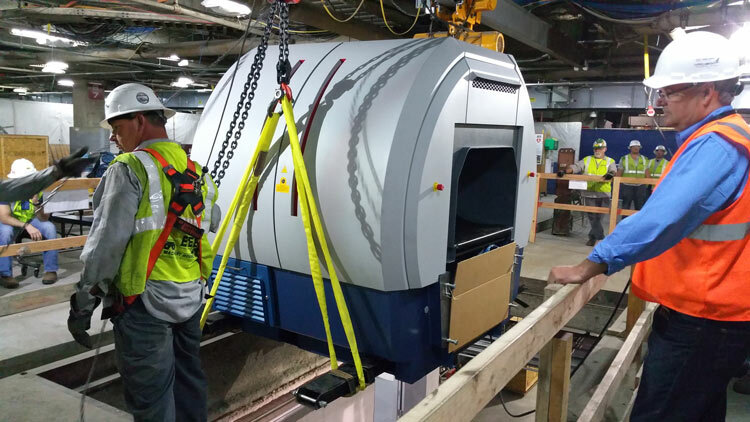 Transport And Delivery: Luggage Scanners to LAX - Triple-E Machinery Moving, Inc.
Checkpoint luggage inspection security scanners safely transported and delivered to LAX. 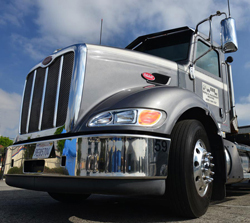 Moving technologically advanced equipment systems is highly specialized work, and Triple-E Machinery Moving, Inc. has the experience, skills and equipment to get the job done right. 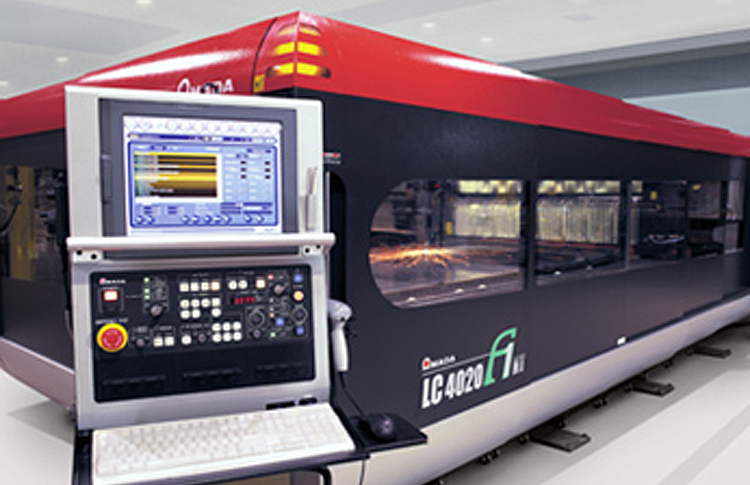 Since our founding we have specialized in machinery moving, heavy equipment moving and plant relocations for production equipment and machinery, such as large-scale sheet fabrication machines, punch press and sheet metal cutting systems, food production and processing equipment. Triple-E is proud to have a close working relationship with many of our customers for over four decades. Modern equipment/systems such as these luggage scanners are often very delicate and vulnerable to damage. 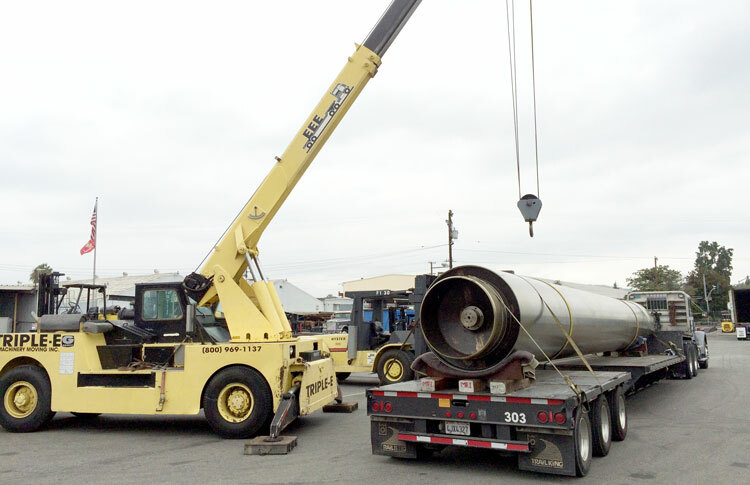 Improper handling of valuable equipment is a risk our customers simply cannot afford to take. 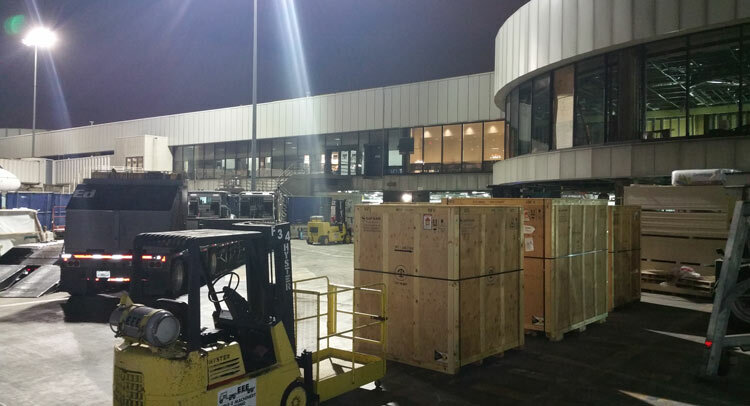 These checkpoint luggage inspection security scanners were safely transported from Texas, and delivered to their new home — Los Angeles International Airport (LAX). Due to constant traveler traffic throughout the day, our work at airports around the country is typically performed during off-peak hours. 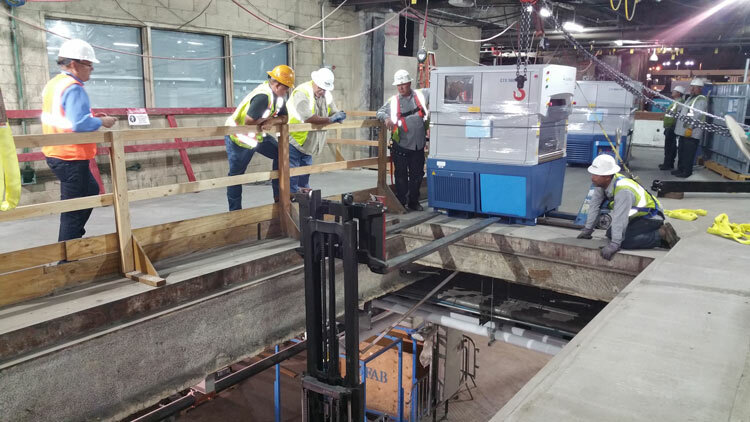 Onsite projects at LAX, for example, typically take place between midnight and 5 o’clock in the morning. The project begins in the early morning hours as Triple-E arrives to begin the process. Our customers depend on our ability to provide crews 24 hours a day, 365 day a year. 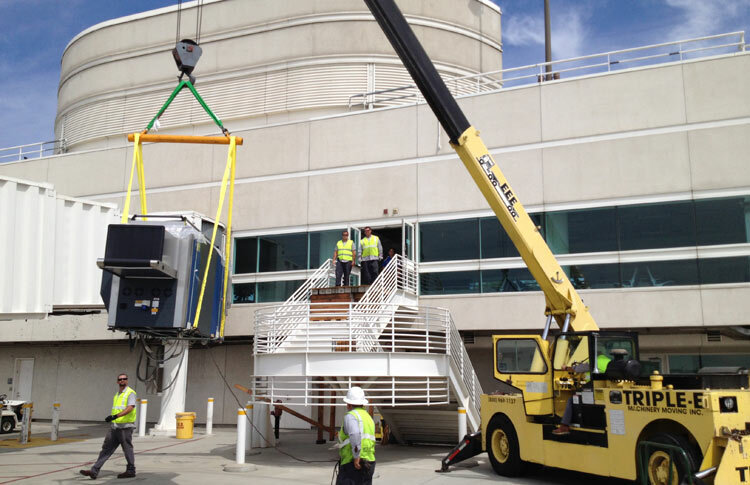 Once arrived at LAX, our crew was tasked with unloading the scanners from the trucks, and uncrating the machinery. 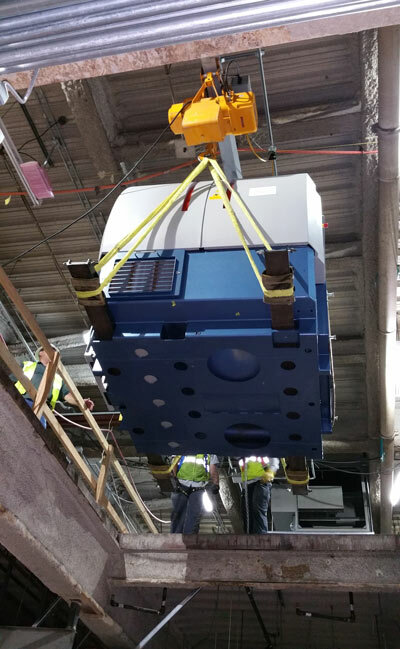 We then carefully lowered each piece into the basement through a hatch in the roof with specialized equipment and gear. 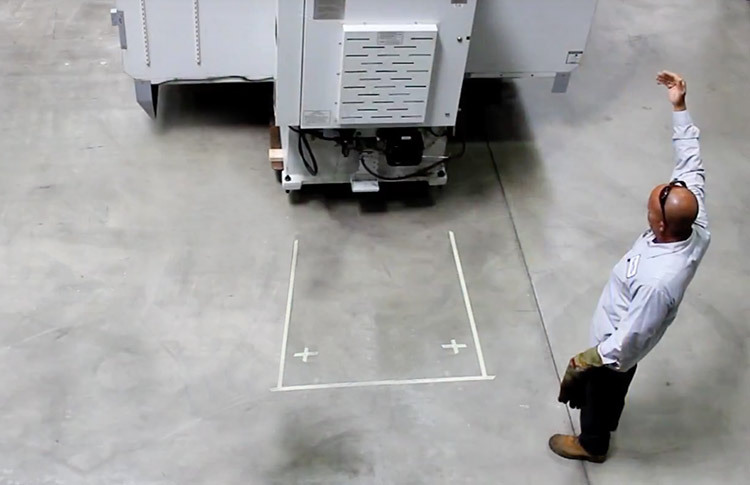 Triple-E then precisely set the heavy machinery onto custom concrete pads, so the manufacturer representatives could calibrate and get the machines up and running. Our customers know that once their equipment and machinery are in our hands, they can rest assured the job will be performed with the highest level of attention to safety and efficiency possible. Get in touch today for a bid or quote.